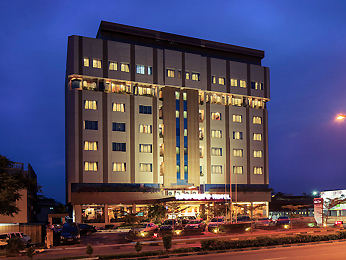 Mercure Batam is a hotel with local color and distinctive style, located at central business district of Batam Island, Nagoya. Mercure Batam with 8 storey's building offer 159 fully refurbished spacious, modern and comfortable rooms with wooden interior and modern facilities. Offers 4 meeting rooms, 1 ballroom, health club/gym, sauna, spa/massage, steamroom, whirlpool & outdoor swimming pool. 20 minutes from airport,15 minutes from International ferry terminal & 5 minutes to shopping centre.